Rafael Nadal and Roger Federer, rivals and friends, personify the values and virtues of their sport across frontiers, and are an example for all of society to follow. 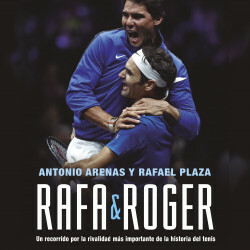 Starting in the present day, during the 2017 season, when the two legendary adversaries returned to rule over the sport with an iron fist after a period in the background, the authors explore the depths of Nadal’s and Federer’s personalities after spending years beside them, day after day. Walkers Cultural Enterprises Ltd. (Taiwan).